Why Choose CertificationKits For Your CCNA Certification And Training Needs? Here at CertificationKits we are here to assist you with putting together the best Cisco certification lab for your hard-earned money. In addition, we have the widest selection of equipment available of any vendor to meet all of your Cisco certification training needs at an affordable price. You can try a simulator program that just will not give you the experience you need to master the Cisco certification concepts. There are just too many things you can‘t do with a simulator that I cover in other parts on my website. Besides, would you feel comfortable with the pilot of your airplane whose only experience was on his Xbox 360 playing Flight Simulator? Probably not. Nor will most employers feel comfortable hiring a Cisco technician who never opened a Cisco router or switch. You can try to find all the pieces on eBay and purchase them from multiple individuals who are dumping their equipment for various reasons. You will then have multiple shipping charges that will ultimately make your total purchase price more expensive than if you purchased it all in one place. Also good luck getting support if you get stuck in your Cisco Certification studies or have a problem with your equipment. How can they warranty something they don’t stock? Will RacerX321 reply to your emails if there is an issue? Anyway, we sell the same kits on eBay too and we consistently have the best price on eBay for Cisco CCNA certification kits. You might find another established hardware reseller who may be close in price to us, but they are just a hardware vendor. Ask them what STP is and they may reply “Wasn’t that a band in the 90s…Stone Temple Pilots?”. Something tells me they may not be able to assist you with any of your technical questions short of repeating things they have overheard but not actually done. Yes, a few of the certifications are older. That goes to show that we did not get into the IT industry in the past year or two. Associates on staff have managed large network infrastructures and migrations for Fortune 500 companies, owned a training school and been an instructor for all the certifications listed above and also have published training books. CertificationKits has been in business providing Cisco certification kits since 2000. We have developed a reputation on providing a complete Cisco certification training lab solution at an affordable price. We can cover Cisco CCNA, CCNP and CCIE labs. You will get our custom Cisco CCNA study guide and training CD along with all the extra accessories you will need to hit the ground running. We also stand behind our products. If you do have a problem with a unit purchased from us, you can rest assured that we will honor our warranty as we are committed to providing world class service! 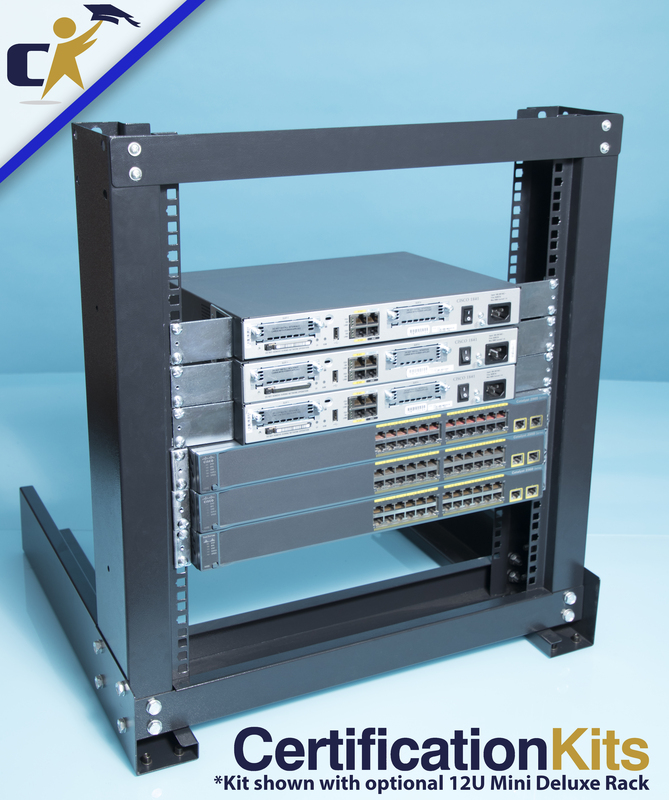 Occasionally those looking to purchase a CCN A lab kit will say…why is your CCNA kit more expensive than what I would pay if I picked up the same Cisco router and Cisco switches on eBay from people who are just dumping them? At first glance, it may seem accurate that you can save money that way. But many times it is not and we really need to compare apples with apples. If you bear with me a minute, I will be more than happy to explain some of the pitfalls and issues. The first issue many people can easily relate to is most eBay sellers will charge $18 to $29 to ship a single switch or router. While a majority of the kits include two to six routers or switches; well you can see those shipping fees can add up quite quickly! For a 6 unit CCNA kit you could be paying $120 to $150 just in shipping purchasing from multiple eBayers. The second item many new students will overlook is the fact that many eBay sellers don’t include simple things like power cords, console kits or transceivers. Have you looked at how much they charge for a power cord from Staples? $9 just for a power cord. If you got a kit with six units in it…well again, that adds up quickly. Console kits? They are going to run you about $10 if ordered separately and rarely do you see them include transceivers when required at $15 each. So you can see how this can easily at $50 or more to the price of your CCNA lab kit or you are missing components you should have in your CCNA lab. The third item you will want to consider is all the study material we include in our CCNA kits and what that is worth. Most CCNA kits do not include any sort of CCNA lab workbook. Without a CCNA lab workbook, what good is the lab? We include our professionally printed CCNA lab workbooks. You will find rampant on eBay sellers including pirated PDFs. Is that the type of vendor you want to deal with? If you are so inclined to pirate material such as that, I am sure a quick Google search will turn up a site or two with pirated PDFs and you don’t really need to have a vendor provide them for you. But in my opinion there is nothing like a real book to work from. A bunch of loose leaf pages printed on an ink jet printer is not the same paper weight, quality or as convenient. But that is not it. We also include our CCNA test engine, our CCNA CRAM sheet and our CCNA TCP/IP Study Poster. These are all professionally printed items that are top of the line. Individually these items run $85 and our bundled price is $59. But we include these all for free in our CCNA kits! The forth item to consider is the customer service factor. If you have an issue with an item you get on eBay will you remember who you got it from? Will they respond to your emails three day, three weeks or three months later? We have been in business selling CCNA kits for ten years now on the Internet. We are not going anywhere! We keep a large inventory of stock to be able to address an item if it goes bad and we support our customers when they have questions on the why and how things work. Try to find an eBayer who will do that and it is priceless when you are pulling your hair out. The fifth item to consider is our warranties. All of our products come with our standard warranty and we offer extended warranties too. With our warranty process if you have a problem, we cover the shipping back and forth. We want to make it easy for you. The sixth item to consider is our Trade-Up program. What if you make a mistake and purchase the wrong thing and don’t figure it out for a day or a month? What do you think the eBayer’s response will be? What if you outgrow you router a year down the line? With our Trade-Up program you can trade in any item you purchased from us at full current retail value! Never have your equipment become obsolete! Now how cool is that? The seventh thing to consider are all the cool things we have brought to the Cisco certification community. The free videos, forums, blogs, free games, free iPhone and Android apps. We do this for all of you…our customers…our friends. So if you review there are close to $200 in tangible items we include in our kits and much more in the intangibles. We truly hope you will take these items into consideration when you make your CCNA lab kit purchase and we wish you success in your Cisco certification pursuits. We are your one stop shop for your Cisco CCNA, CCNP & CCIE certification training lab hardware needs!